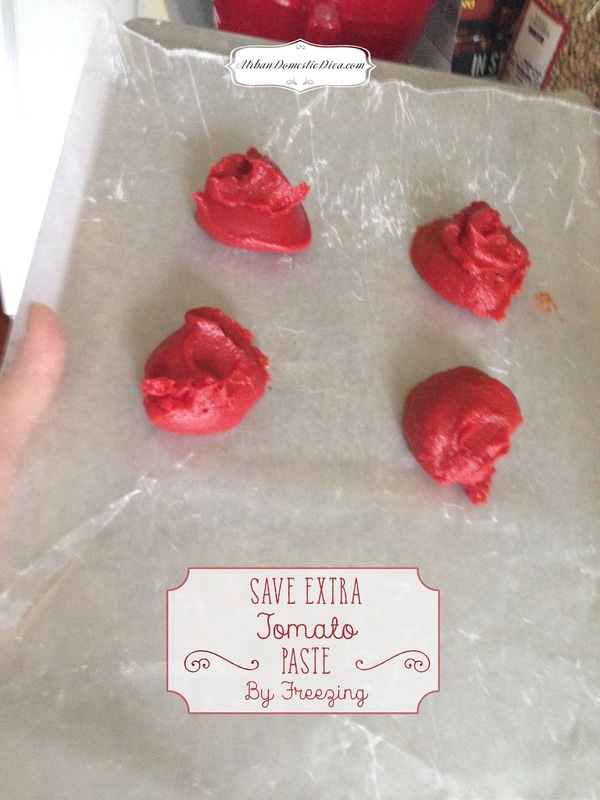 Do you cry inside when you open a can of tomato paste for a recipe, only to use 1 tablespoon? I decided to grab a measuring spoon and measure out the left over tomato paste in heaping tablespoonfuls and set the mounds on some wax paper. I set these on a tray and threw them in the freezer for a few hours. I pulled them out, threw them into the freezer bag and voila! You have tomato paste for the next time time you just need a tablespoonful. If you make a big vat of tomato paste, you can freeze it in ice cube trays. Each cube equals 1 tablespoonful. I cannot tell you how happy I am that I came up with this. I already used some of it in a crock-pot chicken soup. I hate being wasteful. This is a great solution. I also plan on making tomato paste this weekend too and I plan on freezing it in ice cube trays, so stay tuned for that post!